This frozen mojito is fun, festive, frothy, and refreshing. Make it ahead of time and it will get extra frosty in the freezer. Then scoop into glasses and enjoy. It’s a fabulous cocktail for summer barbecues. I just got back from a week in Puerto Rico with my husband and two of my boys. It was incredibly relaxing. There’s something about the ocean that pulls the tension right out of me. It was warm and breezy – perfect weather for sitting in a beach chair and reading and sipping the occasional rum drink. At the poolside tiki bar I discovered my new favorite caribbean cocktail: a frozen mojito. I went up to order a regular mojito and a woman seated at the bar told me I had to try it frozen. So I did. It was perfect – frothy, mint-flecked, light, limey, and refreshing. Puerto Rico calls itself “The Rum Capital of the World.” Rum production started in the mid 1600’s as a byproduct of the island’s booming sugar cane industry. Rum is still one of Puerto Rico’s main experts despite the fact that the island’s economy has shifted from agriculture to technology and pharmaceuticals. This shift is due to a tax exemption that was offered to manufacturers, in hopes of sparking economic growth. There is so much to see and do in Puerto Rico, besides sipping rum drinks by the pool. 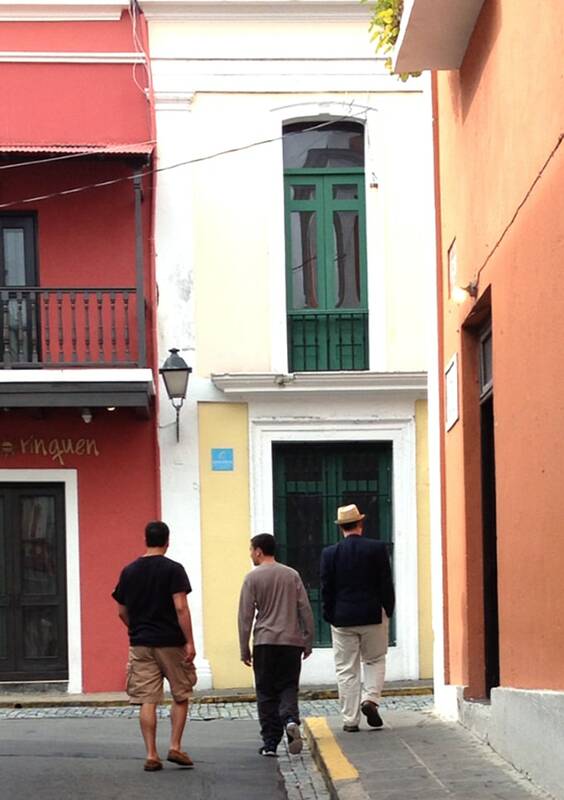 We spent a day touring old San Juan. 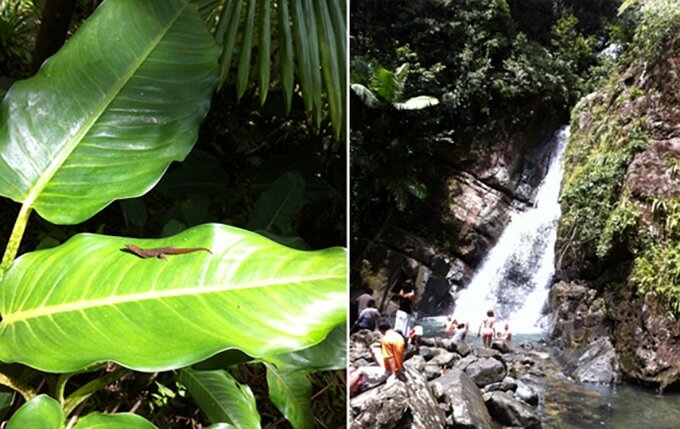 Another morning we hiked in the El Yunque rainforest to a beautiful waterfall. El Yunque is the only rainforest in the USA. Our last excursion was night-kayaking to a bioluminescent bay. We paddled for 20 minutes in total darkness, through a channel flanked by Mangrove trees. Our destination was Laguna Grande, one of only 5 bodies of water in the world containing microorganisms called dinoflaggelates. When you jiggle the water and disturb them, they glow. It was an interesting night but I was afraid to bring my camera along so you’ll have to use your imagination. We had many enjoyable dinners out. 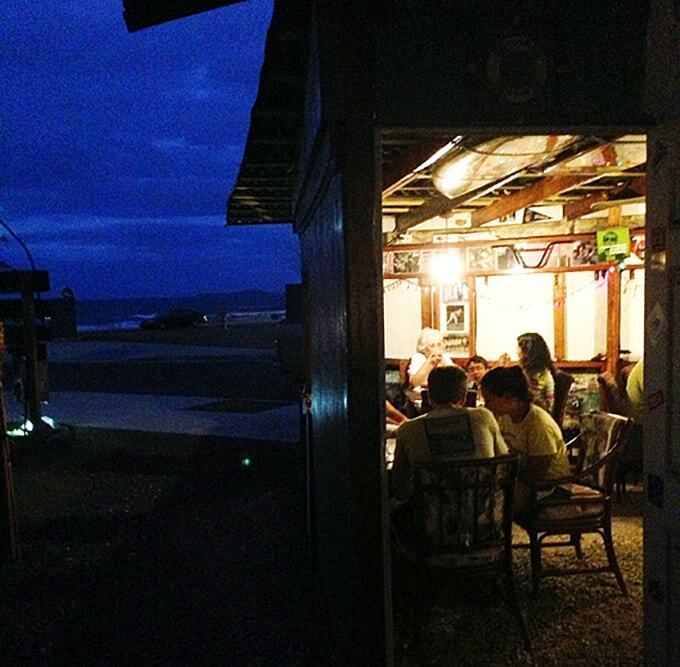 Our most memorable meal was at a tiny shack across from the beach in Luquillo, called Pasta Y Pueblo. There were only 5 tables. It was charming and the service was excellent. All of us ordered fresh fish. I had salmon that was seasoned and cooked to perfection. It sat on top of a bed of ziti with creamy alfredo sauce, and there were lots of interesting drizzles and sprinkles of flavor around the plate. 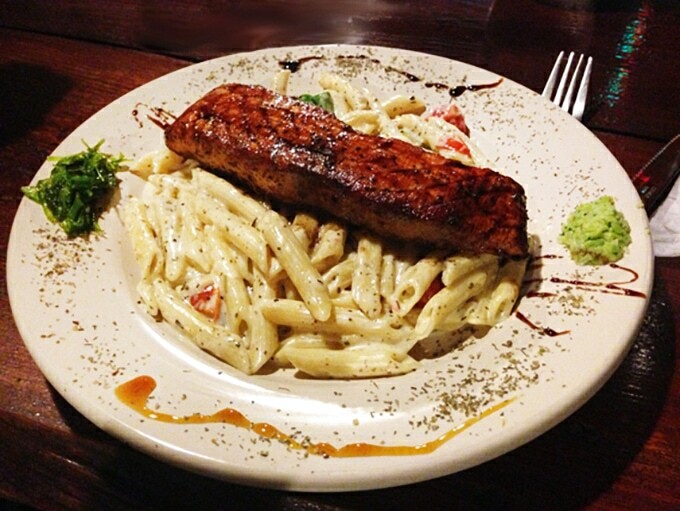 Pasta and fish is not an obvious pairing, but it was great! This trip has got me thinking about summer barbecues and what I’m going to throw on the grill. I definitely know I’m serving frozen mojitos. Here’s the Frozen Mojito recipe. If you try this, I hope you’ll come back to let me know what you think! 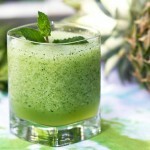 Limy, minty, refreshing frozen Mojitos are great for a party. You can make them ahead and they get even frostier in the freezer! 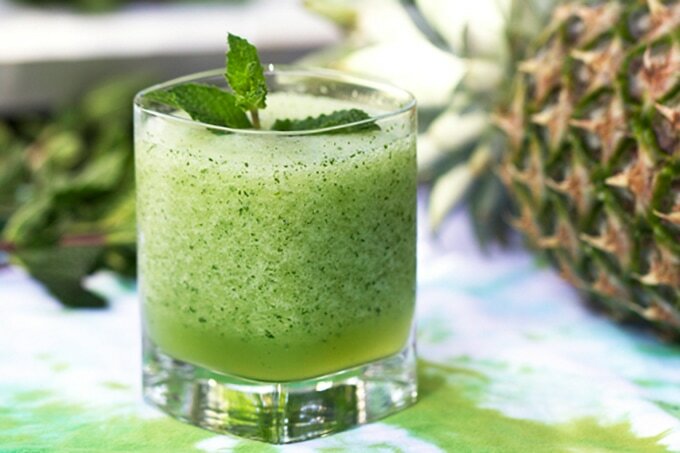 Combine simple syrup or agave nectar with lime juice and mint in a blender. Pulse several times to combine. Add ice and rum and pulse until ice is finely crushed and mint is chopped into tiny flecks, giving the drink a light green hue. 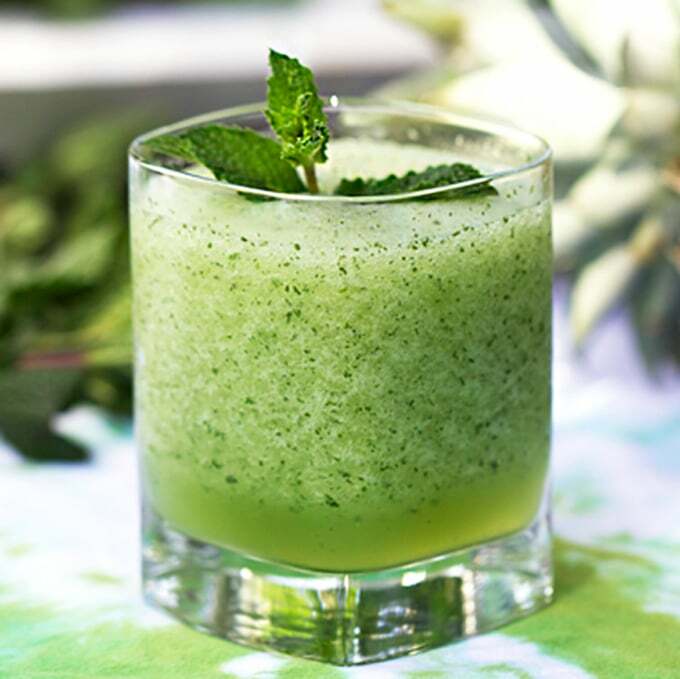 Pour into 2 glasses and garnish with mint sprigs and slices of lime. Enjoy! Note: to make them extra frosty, prepare them an hour or two ahead and store them in the freezer in airtight containers. Stir well and scoop into glasses and enjoy! Lisa… can’t wait for some recipes from your trip to Provo!!! Love your Blog!! Love the Turks and Caicos!! Post pics of your trip!! Yay!! Perfect time of year for this! I can’t wait to make! Thank you thank you! Frozen mojitos? Yes please! It’s only Thursday so I could sure use a couple of these! Found your site through Pinterest. Your pictures are amazing – I almost tried to grab your glass… I was disappointed when I jammed my finger into the screen. Thanks for posting, this will be coming with me to the river this weekend! Had the best Mojito of my life(!) last week while in Tulum, Mexico. Not sure what specifically make it so good (other than the ambiance, sunset, company of family/friends) but there was definitely a lot of sliced limes and lots of pulped mint leaves – yum! Thanks for bringing back a good memory!